Birds' bones are very fragile, making broken wings a common injury. A broken wing prevents the bird from flying. If you notice a full-grown bird stumbling along the ground holding one of its wings lower than the other, chances are good the wing is broken. Smaller birds, such as doves, are easy to catch and treat on your own. Larger birds, such as owls, require experienced help. 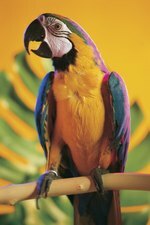 Call an aviary veterinarian if the bird has infected wounds or large, open sores. Place the bird in a cage or carrier. Use a net to catch the bird if it tries to run away. Take the bird to an enclosed and quiet area. Remove the bird from the cage and check the broken wing for any obvious signs of injury. Wash any wounds you find with water and anti-bacterial soap. Dab some cornstarch or baking soda on the wound to control the bleeding. If the wound appears infected, take the bird to an aviary veterinarian. Cut a 12-inch strip of veterinarian bandaging tape. This tape does not stick to the bird's feathers. Gently lift the bird and fold its broken wing against the side of its body, in the natural position. Wrap the tape gently around the bird's body to hold the wing in place. Make the tape just tight enough that it holds the wing in place. Wrap the tape under the unbroken wing and in front of the feet. Place the bird on the ground and observe him for five to 10 minutes. The bird should be able to walk and move his unbroken wing. It should also be able to breathe easily. Adjust the bandage, if necessary. Place the bird in a small birdcage or carrier. Give it fresh water and seeds daily. Check the bandage's fit daily and change it if it gets dirty. Leave the bandage on for 2 to 4 weeks. Once the bandage is removed, place the bird in a larger cage so it can practice flying. If the bird is unable to fly properly, contact your local wildlife rehabilitation center or veterinarian.